“Sunday Night Football” debuted a new feature during the Cowboys-Cardinals preseason game. The “Green Zone” was created to show how far a runner had left to reach the first down marker. It is unclear how what the new feature adds that the yellow first-down line already provided. Initial reactions from football fans on the broadcast’s new look were negative, but there’s a chance that could change over time. 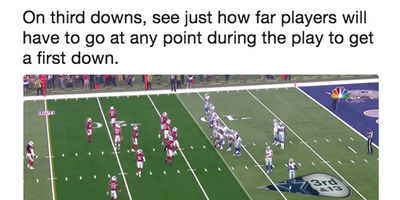 The “Sunday Night Football” crew debuted a new feature during their broadcast of the Dallas Cowboys and Arizona Cardinals preseason game on Sunday – the “Green Zone” – which shades the area between the line of scrimmage and the first down marker a darker shade of green than the field on third downs. For fans who weren’t prepared for the change, it was a bit visually jarring, but the “Sunday Night Football” team insisted it was a way to make it easier for viewers to see how far a ball carrier had to go in order to reach a fresh set of downs. 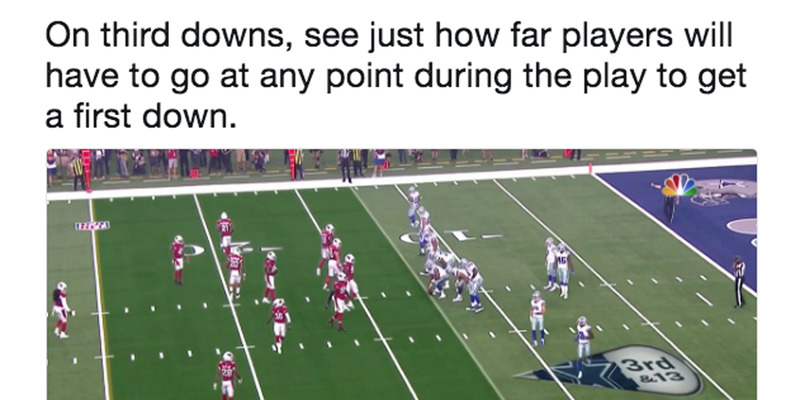 Knowing how far a runner has to go until they reach the first down marker is a crucial part of watching any play develop, but many were left confused, as that issue was already essentially solved by the yellow line that is now a feature of any televised football game. Fans were perplexed, as it appeared that NBC was attempting to dramatically fix what certainly wasn’t broken, and they voiced their confusion over Twitter. Hahaha. NBC with the Green Zone!! Like the yellow line wasn’t good enough ???????????? Other fans were even more dismissive of the new technology. Never in my life do I ever want to have to see The Green Zone on my television screen ever again. No green zone on that third and 1? How am I supposed to know how much more yardage they need? ???? While fan seemed fairly universal in their disapproval of the broadcast’s new look, NBC stands by the decision. The new feature does make more sense when considering the Skycam view, which became a more essential part of broadcasts last season. Still, from the traditional broadcast angle, the “Green Zone” feels redundant. Preseason is a time for networks to tinker with their broadcast, so there’s little harm in NBC trying things out to see if they work, and there’s a good chance that given a few years to adjust, the “Green Zone” will be as highly appreciated as the yellow line has become over time. That process will take some time though, and in the meantime, it’s clear that football fans are particularly fond of NBC’s latest development.